Our weekends deserve new life, don’t you think? I say we find a reason to get excited about the mornings again- something to pair with that strong cup of coffee and cream. 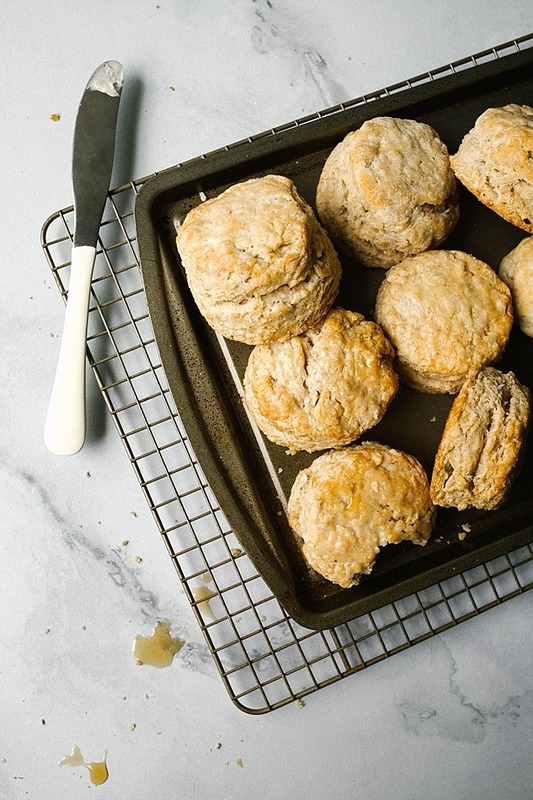 These maple oatmeal biscuits are weekend warriors, making a delicious statement every time they emerge from the oven. If you’re as into making weekends great again as I am, let’s just agree to start here. I can remember the days when weekends were saving grace. Monday and Tuesday would thunder into Friday with an onslaught of assignments and tests and premature gray hairs. Grades and deadlines loomed around every corner, so the primary sanctuary from the stress of school were those bookend days of the week. There’s not a teenager alive who doesn’t wait for the weekends with the same anticipation as they do the recess bell. It’s just science. But in adulthood, Saturday and Sunday don’t care. It doesn’t matter that you worked hard all week or that you’re desperate for a break. The weekend isn’t impressed by what you accomplished Monday through Friday because there are groceries to buy, lawns to mow, and cars to clean. Adulthood takes hostage those few hours of weekend solace and ransoms them for nine bags of raked leaves, an unloaded dishwasher, and few hours worth of ironing. It’s savage. You notice I haven’t even mentioned children yet. In the BC years (that’s the “before children” years), weekends might have at least included thirty extra minutes for a second cup of coffee. There would be time for blown-dry hair and a pre-dinner cocktail, maybe even an hour for catching up on your DVR. Let’s pour one out in remembrance, shall we? Weekends with kids are a different animal. There are bottles to warm and sippy cups to refill. Kids are not concerned about you reading the paper because kids want their Cheerios. Kids want to go to the park. Kids want to remove all of the plastic cups from the cupboard, litter them throughout the house, and then poop their pants while you’re in the middle of cleaning it all up. 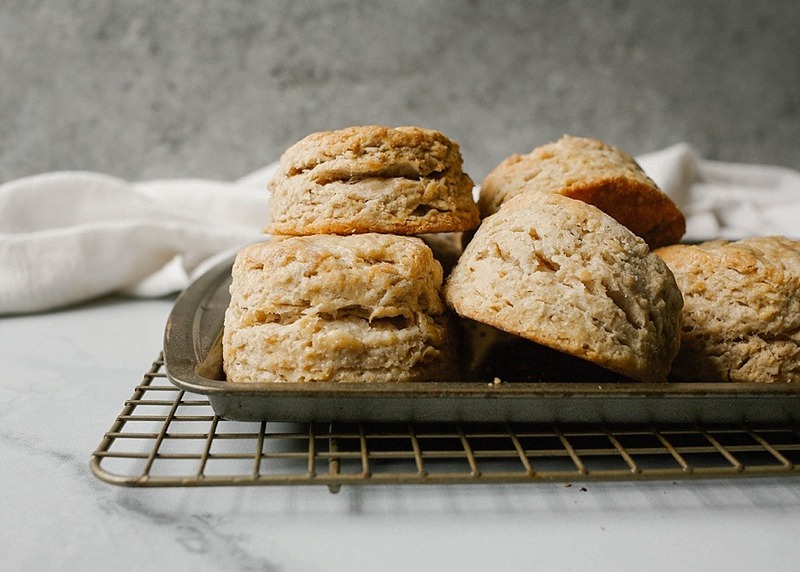 These maple oatmeal biscuits might save your weekend. They won’t change a fifteenth diaper or freshen up a gone-cold mug of coffee, but they are good enough to add some luster to the weekend. 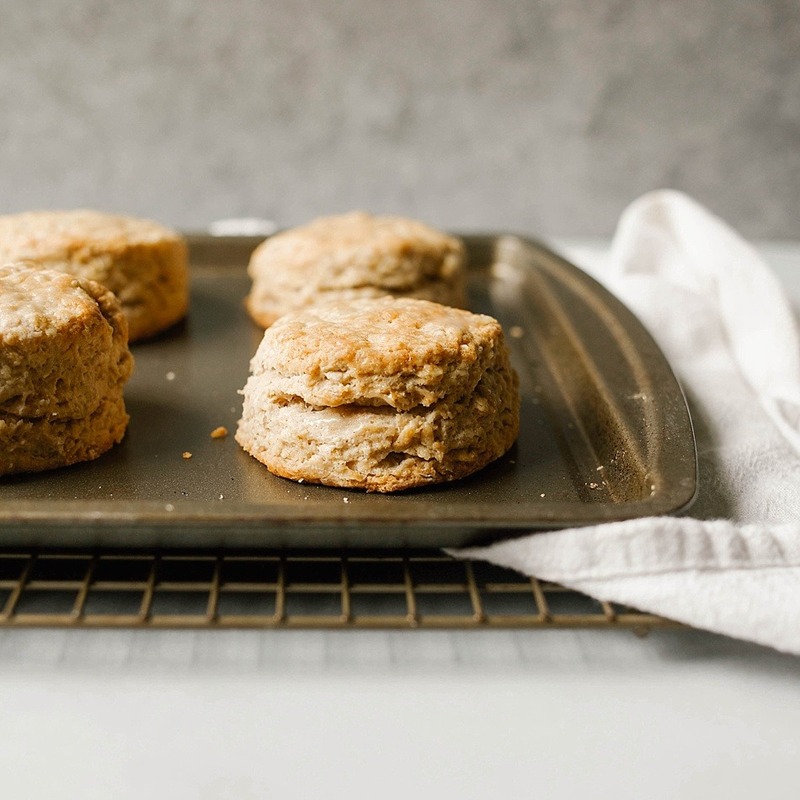 A one-bowl dish that freezes like magic and reheats like a dream, these maple oatmeal biscuits are the rising star of the weekend, and you need them in your life. We start by tossing together a few dry ingredients- flour, sugar, the usual suspects. Oats are next, which account for the extra fluffy, slightly nutty flavor that we wind up with once the maple oatmeal biscuits have baked. Ice cold butter is incorporated throughout before the dairy and a heavy-handed pour of maple syrup brings the dough together. 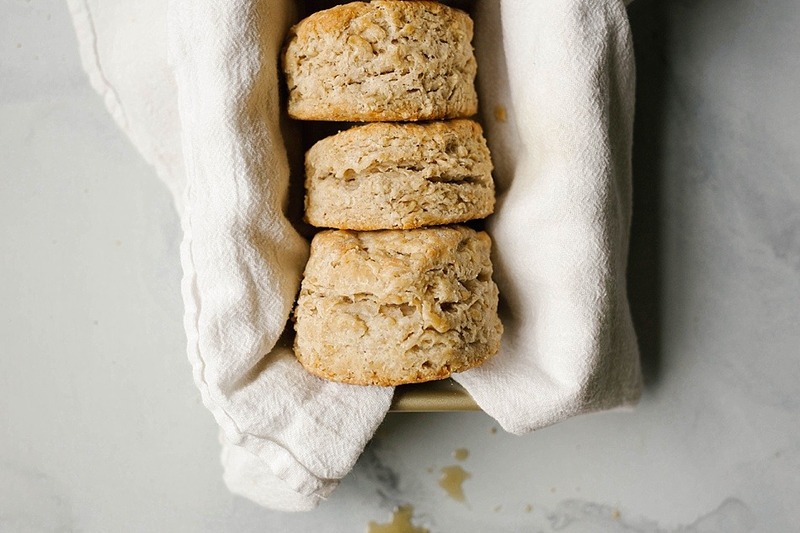 For the best success with these maple oatmeal biscuits, work quickly to ensure that they enter the oven with chunks of chilled butter throughout. Handle the dough as little as possible so that they stay airy and fluffy, and use a floured cutter to trim out rounds, pressing straight down without any twist. I like to brush my biscuit tops with a little extra cream or butter for browning, but I think a simple painting of maple syrup would be perfectly sufficient here as well. You decide. I think we should bake back the wonder into our weekends. Make these maple oatmeal biscuits as a means of celebrating the good Saturday and Sunday have to offer, and I promise you that things will start looking up. Happy week to you all! These maple oatmeal biscuits are soft, layered, Southern-style biscuits sweetened with maple syrup. Perfect for breakfast and brunch! Preheat the oven to 415 degrees. Prepare a baking sheet with a sheet of parchment paper. Combine the flour, brown sugar, baking powder, salt, and cinnamon in a large bowl. Stir in the oats. Use a pastry cutter or the back of a fork to cut the butter into the dry ingredients until it is reduced to pea-sized clumps. In a separate bowl, combine the milk and maple syrup. Pour the mixture into the dry ingredients and butter and fold just until combined. Turn the mixture out onto a floured surface. Gently pat together, but be careful not to overwork. Pat out to 1” thickness and then fold in thirds like a letter. Rotate the dough 90 degrees and then repeat this patting and folding process. Repeat once more for a total of 3 sets of folds. Pat the dough out to 1” thickness and use a floured biscuit cutter to cut out rounds of dough. Gently pat together the remnants and cut out more biscuits. Combine the melted butter and remaining maple syrup together and brush over the tops of the biscuits. Bake in the preheated oven for about 12-15 minutes, or until the tops are golden brown. Thank you Kate for this marvelous recipe! I googled “oat biscuits” and found you for the first time. I was planning an extravagant healthy biscuit with muesli, so took a chance and used your Maple Oatmeal Recipe, substituting a cup of Bob’s muesli for the cup of oatmeal. Even though my RD wife warned me not to alter recipes, I did anyway and these came out FANTASTIC! The best part is the hint of maple in every bite, and that they’re nutritious. Yes, they turned out tall and flaky like the photos you included with your recipe. I will be visiting your recipe files often after my Friday (not weekend yet) SUCCESS! Loved your backstory as well, and how true! God Bless You and your family! 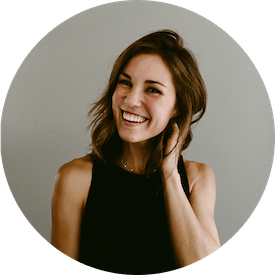 Oh how I love the way you wrote this blog post, Kate! It is endearing and comical, and makes a whole lot of sense. Adulthood is world’s different from being a teenager and a kid; and I’m sure a lot of us miss those days. I’m not yet a mom but have taken care of my younger sister since the day she was born and it sure is not a walk in the park. I would love to try these maple oatmeal biscuits this weekend. 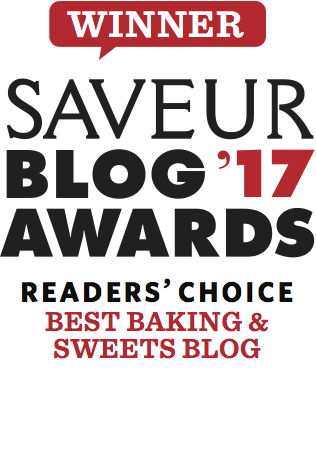 Can I use a different kind of sugar for this, say, coconut sugar? And the old fashioned oats can be substituted with what? Thanks a lot! Thank you! I love hearing from people who identify. That’s a really great question. The coconut sugar will definitely affect the flavor, but I’m not sure it will have a terrible effect on the texture. I’m sure there will be some differences, but I think it would be okay! lmk if you try! Quick question: you say 1/4 cup (100 grams) of brown sugar, but when I weighed, my quarter cup was 50 grams. So is it 1/4 cup (50 gms) or a 1/2 cup (100 gms)? Thanks! oh gosh, what a terrible error! thank you for catching that. it is 1/4 cup (50 gm). thanks so much! I just made those, I used organic gluten-free flour and oats, organic soy milk, butter and unrefined raw cane sugar. DELICIOUS, Thank you! I’m glad to know they worked well with the cane sugar and soy milk!!! I always wonder about those particular substitutions. Thank you so much for sharing!!! Hi! I’m wondering if you have ever cut these out and frozen them (raw), so you could bake only what you need at a time? If so, how’d they do? Thanks! I haven’t! I have frozen after baking before and they heat up in the toaster oven splendidly. If you try the pre-bake freezing, lmk how it goes! I’m going to bake a batch and take a couple out to freeze just to test it out! I’ll let you know! 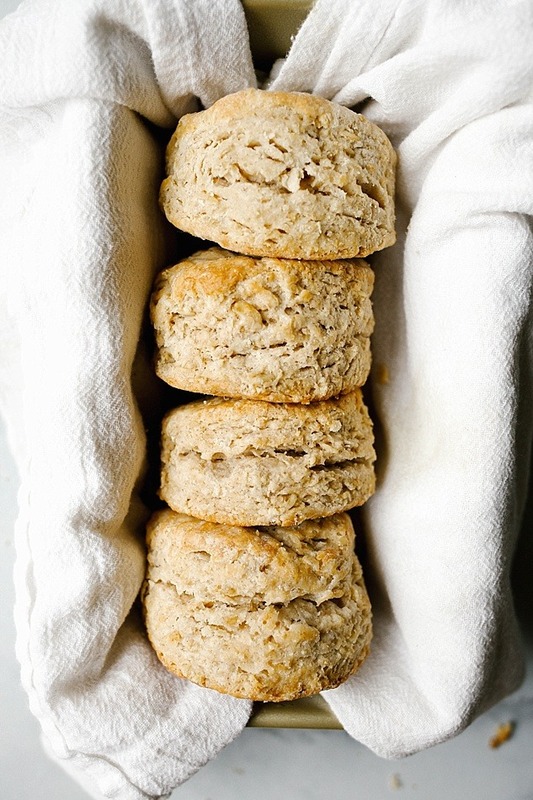 Loving how flakey these biscuits look and they sound absolutely delicious…. I am drooling!! This recipe looks amazing! I hope to try it this weekend. I just found your blog, and it is so wonderful! I cant wait to scroll through and see what delicious things I can find. Thank you for putting this all out here for us! Jetzt kann ich an der Diskussion nicht teilnehmen – es gibt keine freie Zeit. Ich werde frei sein – unbedingt werde ich schreiben dass ich denke. Oh em gee. I remember weekends! Even without kids, grown-up weekends are a different animal than those blissful teenage weekends :). These biscuits look INSANE! Please teach me how to make a biscuit look that perfect! YES. I would bet that Aimee is about a year and a half away from operating those like a dream. She may be like 5-6 years away from getting my current French press situation. yes! pancake weekends!! I love it. I need more of those. These sound amazing!! Could you use a milk alternative? Almond or cashew? that’s a great question! I feel like it would be possible, but the texture would be majorly different. I would choose the fattiest plant milk you can find for starters. If you try it, lmk how they turn out!! Made these this morning. They’re soooo good! Decided to drizzle them with a little spicy honey and top with some flaky sea salt—holy cow! Thanks for another great recipe. spicy honey!!?!?!?!?! oh my gosh. someone put some fried chicken on that biscuit ASAP. that sounds incredible!!! the only reason i look forward to the weekend now is so i can have a decent breakfast without rushing lol & these biscuits look mighty fine for a sunday morning breakfast!